Dubai is famous for its ludicrous lavishness and adding in this a new surprise has come up in the line – Rotating Tower Skyscraper. 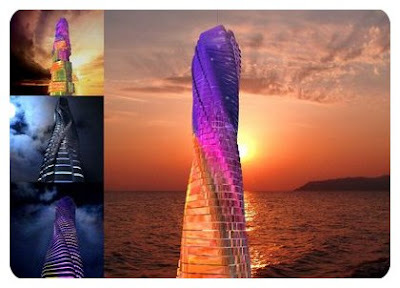 Rotating Tower Skyscraper is going to be a building with Dynamic Architecture which is capable of rotating by having a constant motion making each of its floor to rotate, spin and move around to change its shape constantly… Amazing!!! This is one of the conjure and practical application of the newest technology made by human that is going to become a reality by the developers in Dubai. ‘Dynamic Architecture’ is the principle used by David Fisher, Florentine architect which has been used for the plan of making ‘Rotating Tower in Motion’ and this type of experiment has never been done before. Each floor will rotate independent of the other one with a full angle of 360 degrees. Adding to this pioneer, enough electricity will also be produced by the building for itself and even for surrounding buildings also.. How so much electricity will come??? The Rotating Tower is going to consist of 59 rotating floors or more correctly can be called as modules, all of which will have a view of the outside world that will be constantly shifted. The speed of rotating is 6 m/s so that the rotation will not get noticed by the residents. Designs that will be very complex are going to be made with the constantly changing exterior due to the independent rotation. The skyscraper will be 313 m in height and will consists of 68 floors including apartments, offices and 6 star hotel and 5 grand villas on the top floor. Wanna have one for you!!! The ‘Penthouse’ villa will be going to have a garden, Arabian majlis and a swimming pool and special elevators will be there for the transfer of the vehicles from down to top. For maintaining the tower’s dynamic architecture, an extending platform of heliport will also be made on the top floor which will extend from its shell at the time of landing.